Download this Western logo file (right click and “Save As”). Don’t forget where you’ve saved this file. In Microsoft Outlook click on Tools, then Options. In Outlook for Mac, click Outlook and then Preferences. Click on the Mail Format tab and then click on the Signatures button. If you already have a signature created, you can edit this, otherwise click on New and select a name that is fitting for the signature. In Outlook for Mac, click on Signatures. Paste the signature template that you copied onto your clipboard. Under “Choose default signature” set “New messages” and “Replies/forwards” to the signature you just created. Now click OK on the Signatures screen and again on the Options screen. Now when you compose a new e-mail you should see your new signature. Click on tools on the menu bar and then select Account Settings. Click on your e-mail address on the account listing on the left side of this screen. On the right side of this preferences screen you’ll see a place to type a signature. Make sure to put a check mark in “Use HTML”. Click OK at the bottom of this screen. Here in your Internet browser, open this template in a new tab or window. View faculty-specific templates for signatures. Select the entire template by highlighting it, and copy it to your clipboard. If you have an existing signature you can edit the existing one, or you can create a new signature by clicking the + sign and choosing a name for the new signature. Paste in the template that you copied onto your clipboard. Edit the signature to reflect your name, role and contact information. You can now close the preferences panel. Your next e-mail will now have your new signature. Log into Convergence (go to mail.uwo.ca) and click on the options button on the left side at the bottom and under identities, click on Local Account. You will now see an area to type in a signature. Select all of the text in this box and change the font to Arial (click the first letter A on the toolbar). Click the "Add the signature to every message you compose" checkbox below the text field. You can now click the “Save Preferences” button at the bottom right side of the screen. Your next e-mail will now have your new signature at the bottom. Go to https://myoffice.uwo.ca and login, go to your Inbox. Click the Settings icon in the top right corner, click Options. Click Email Signature on the left. Check off both "automatically include" boxes above the text area. If you belong to a specific faculty group and want to use the faculty graphic in your email signature, please click on your faculty below for your template. Select and copy the entire template and paste into your email program. 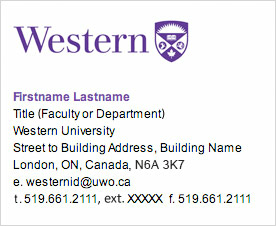 You may also consider including links to Western / Faculty / Department social media channels. Copy and paste the following lines under the last line in your signature.